The “Rentrée” is one of the most important times in the French calendar. It’s when people return to the city, and and normal life, from their August vacations. 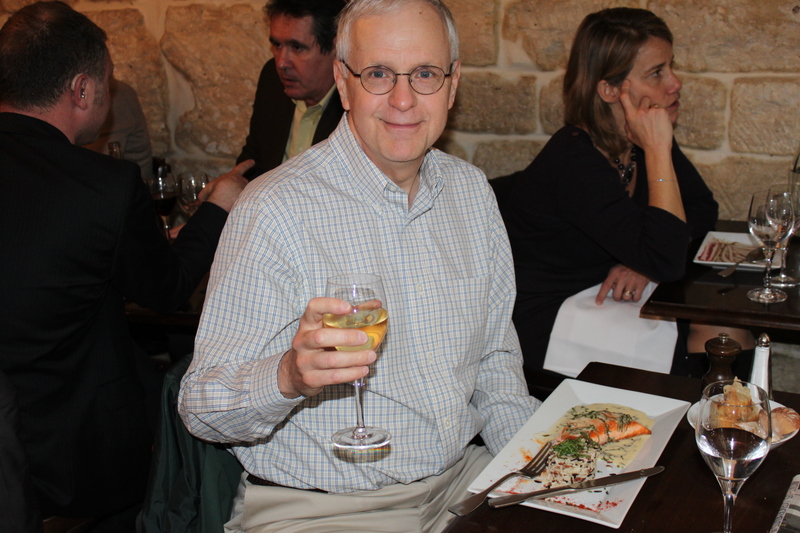 For me, in contrast, the return to Paris is the start of my vacation. It remains to be seen how this mismatch will affect my experience, but it’s already clear that people will be busier in September than I have generally found them in the spring. Fortunately, I was able to catch up with my cousin Lisa and her partner Ali before the demands of school (and the family reunion) seriously kick in. We got together last evening for an apéro at my apartment followed by dinner at Le Loup Blanc (which closed in 2014), an old favorite of both Lisa’s and mine. The flight over was uneventful, the tedium relieved by a really enjoyable movie, Chimpanzee, by Disney. This year I planned ahead for the weight limit, so when my suitcase came in over 50 pounds I just pulled out a pre-packed duffel and checked it as a second bag. My new chip-and-pin credit card worked in the ticket machine to get me from the airport to the city, although the line for the machines was almost as long as the one for the human teller, so the benefit was marginal. The apartment was in perfect condition, and since I now know the owners and their agent the formalities were streamlined. Buying a SIM card for my backup phone and updating my métro navigo pass were a piece of cake. Is this becoming routine? Alas, yes, but as they say here, c’est normal. Fortunately, I was still delighted by the diversity and distinctiveness of the residents of my adopted neighborhood, rue Montorgueil. Even though I rarely converse with people on the street, their appearance and evident character is one of the real pleasures of living here. The appeal extends from the very young to the very old — interactions between parents and children seem to have a special charm; teens in many cases carry themselves with an agreeable seriousness; even the elderly have a pleasing quality to me. There are still cultural mysteries as well, like these young men dancing and singing this evening down rue Montorgueil in skimpy maid’s costumes (except for the one in a mask and bathrobe). 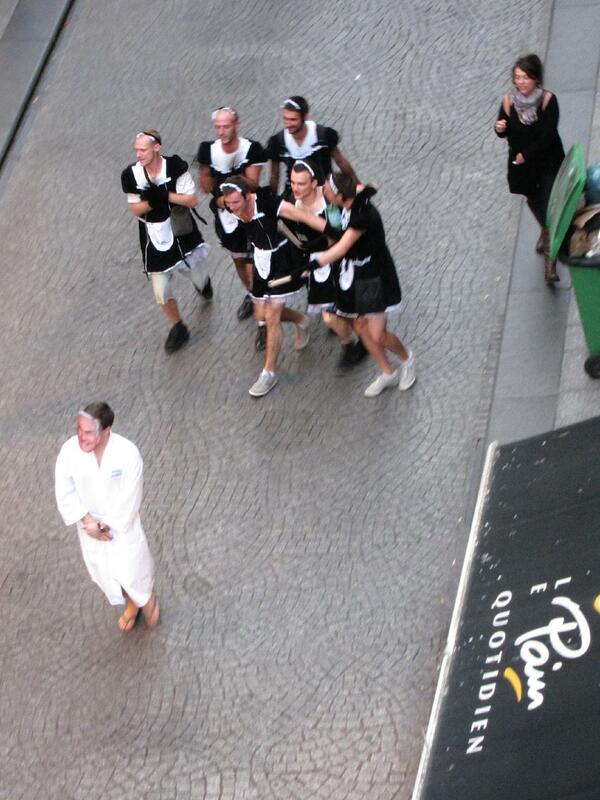 French Maids of rue Montorgueil? Today I visited the Musée Jacquemart–André in the 8eme. Last year the line had extended around the block but today there was no waiting — in part perhaps because September is a less touristy month. It’s an impressive house, reminiscent of the Isabella Stewart Gardner Museum in Boston, with a lot of more-or-less good art; in both cases the donor specified that nothing could be changed, but the museums have found graceful ways to work around the prohibition. 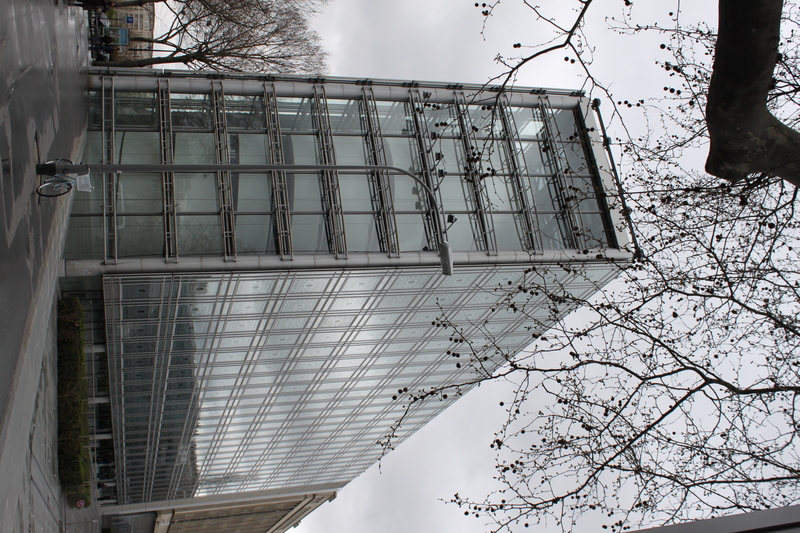 On the walk home I ran across the Pinacothèque, a quirky new museum — the branch I visited opened at the start of 2011 — that I had not previously noticed. I went in because the temporary exhibition was of a private collection featuring Utrillo, Modigliani and Soutine, all of whom are particular favorites. There was a lot of other work, of somewhat uneven quality, but those three masters were wonderfully represented. Unfortunately, the exhibit only runs through Sept. 9. There was a snarky note at the start of the permanent exhibition at the Pinacothèque to the effect that a museum should not be an art cemetery. This nails both the Gardner and the Jacquemart–André, not to mention a few others. Indeed, the monuments of Paris themselves are for the most part not wholly unlike fabulous tombstones. Or, to employ a kinder analogy, one can think of the touristy parts of Paris as a vast museum. While I do enjoy beautiful buildings, the enduring attraction of Paris for me is the life of the contemporary city, and the way it interweaves with the remnants of France’s royal and imperial past. 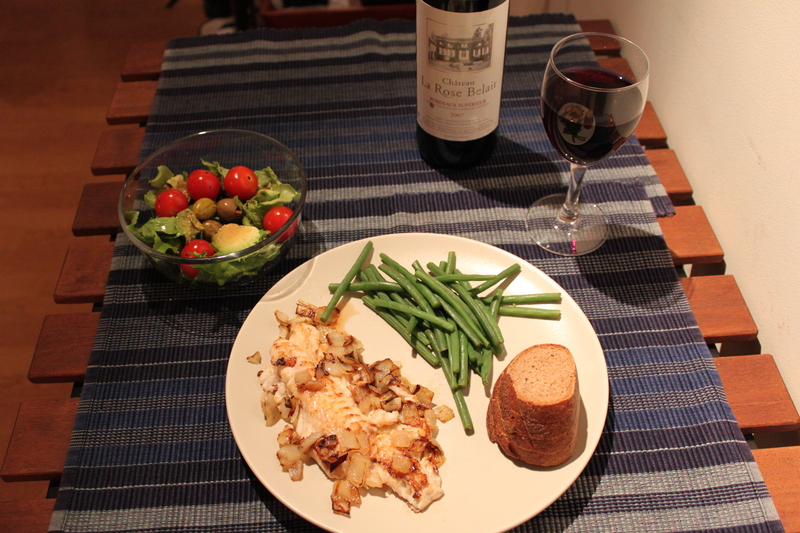 My first home-cooked meal in Paris. I got another late start this morning and I’m beginning to realize that my biological clock has not shifted yet. I’ll set the coffee percolator for an hour earlier tomorrow (even though it will be Sunday). The Institute is quite an interesting place. The museum has some nice items but the displays were often too dimly lit to show them off to the best effect. What I enjoyed most were large signs covering the relevant periods of Islamic history, some carpets and a few exquisite minatures. There’s a charge for the museum, and a separate charge for any special exhibit, but the rest of the building is free and open to the public. Starting at the top, there’s a roof deck with fine panoramic views, including Notre Dame. There are also two restaurants on the top level, one absurdly expensive and the other cheap but uninspiring. Down a few levels is a comfortable library, where I read a magazine for a while. On the ground floor there is a terrific book store and gift shop, along with a nice Lebanese restaurant, where I had lunch. The restrooms are in the basement, which is a very odd place. It’s a very big room filled with a maze-like array of huge columns; they look like the lower level of a great cathedral, but can’t possibly have an architectural function in a modern building. On the way to the Institute I ventured into the somewhat-sketchy urban shopping mall that has replaced Paris’ food market, Les Halles (pronounced “Lay Ahl”). The mall is reputed to be dangerous at night, but it seemed busy and safe when I was there — certainly no worse than Central Square. As well as a huge movie theater it includes a swimming pool that a friend recommended, which I plan to try out soon (in the daytime). My Navigo worked fine in the Métro today; I suspect that you need to show it to the attendant the first time you use it to confirm that the picture matches. I actually had to wait two minutes for a train today. Pretty aggravating, but I’m still a fan. No photo of tonight’s dinner since it was exactly like last night’s. I’ve used up the fish, however, so I’ll have to get more creative tomorrow. It will be interesting to see what’s open, since it will be Easter (Pâques as they call it in these parts). Also, my cousin Jackie is due to arrive tomorrow, and I’m looking forward to catching up with her after several years. She and her husband have developed a safari camp in Kenya that looks wonderful: http://www.sleepingwarriorcamp.com The violence there a few years ago chilled tourism, and they are hoping that a more peaceful atmosphere will re-energize the tourist industry. 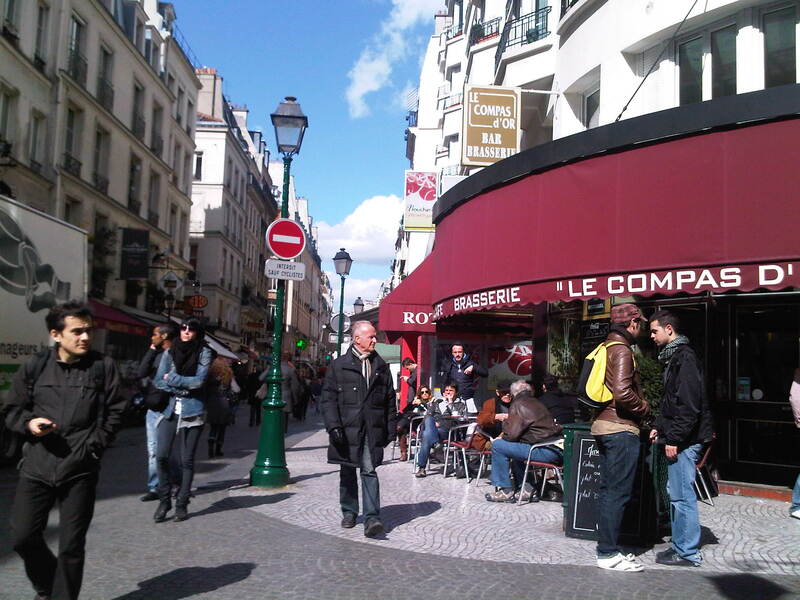 Lunch at Tellus, a cute little restaurant I stumbled on in the 2eme. My first full day got off to a somewhat late start since I’m still a bit time shifted, though not what I would really call “jet lagged”. I enjoyed making my first breakfast, and just now I’m about to start cooking my first dinner, for which I shopped at the rue Montorgueil fishmonger, vegetable store and fruit store. 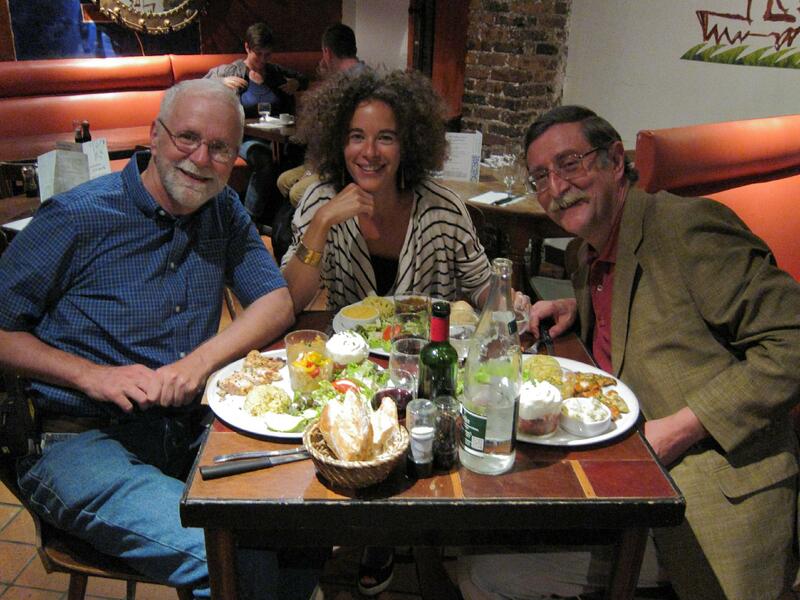 The photo is from my very pleasant lunch at Tellus, in the 2me. After exploring a few more angles I decided to buy an ordinary SIM card for my old BlackBerry, and limit my new one to wifi. It’s cumbersome to use two mobile devices, but this gives me a normal French mobile phone, plus access to email and the web when I’m at a hot spot. The Orange clerk knew no English so the whole transaction had to be conducted in French (which he complimented me on – *blush*). It was chilly and drizzly for most of the afternoon so I made a beeline for the covered “passages”, 19th century shopping arcades. There are some photos at Paris-1 I was struck by the variation in the condition and atmosphere of the passages. Some were well-maintained and the stores verged on elegance, while others were a bit — or quite — run-down. Sometimes the difference was striking between one end and the other of the same passage. After the weather cleared up a bit I went exploring, after which I used my Pass Navigo Découverte Mensuel (monthly subway/bus pass) to zip back home. I continue to be most impressed by the efficiency of the Paris Métro. A display shows how long you have to wait for the next train and I waited less than a minute for both legs of my return trip.